With “Bullet to the Head”, director Walter Hill and actor Sylvester Stallone seem to have sought the gritty, buddy cop action flick of the 1980’s. Unfortunately they fail to remember that a lot of those gritty 80’s flicks really sucked. 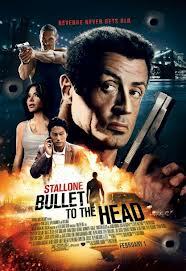 Bullet to the Head centers on the life of hard-boiled hitman Jimmy Bobo (Sylvester Stallone) and the reluctant partnership he forms with the “play-by-the-rules” Washington D.C. cop, Taylor Kwon (Sung Kang) to bring justice to the killer of their respective partners. Bullet to the Head may have had the possibility to stand out if it weren’t for the tired, expectant performance of Sylvester Stallone. Even the performance of the Stallone’s partner in crime, Sung Kang feels woefully out of place. The only redeeming components of this film are the performances by Jason Momoa (Game of Thrones, Conan: The Barbarian) and Sarah Shahi (Life, The L Word). Momoa plays a rival hitman who shows us how he can mix menace with charisma for a character that truly comes to life on screen. Shahi plays Jimmy Bobo’s daughter and neighborhood tattoo artist. She isn’t given much to do narratively, but owns the screen whenever she’s present. Unfortunately the film isn’t given much to narratively. We see the criminal and the cop team up to find the killer (Momoa) of their partners and gradually work themselves up the ladder of corruption. The action and the violence are over the top and to the point. Stallone seems to revel in the coldness of his character. Jimmy Bobo doesn’t wait for one last quip before he blows somebody’s brains out, he just does it. Ultimately, Bullet to the Head favors the brutal “real life” action over ethereal, well-choreographed action we’ve come to expect. If you’re already a fan of Stallone and simply need to check this film off your “watched” list – go right ahead, but for anyone else…at least let it come to video.